Carpal tunnel syndrome is numbness, weakness and tingling in the hand due to an injury or inflammation of the median nerve. It is a repetitive motion injury of the wrist. It specifically refers to an injury or compression of the median nerve as it travels through the carpal tunnel, which is comprised of bones, ligaments and other soft tissues. If the bones become misaligned or the ligaments become inflamed or thickened, they can cause a narrowing of the carpal tunnel, which compresses the median nerve. 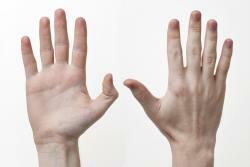 Carpal tunnel causes numbness, tingling and weakness in the hand and first three fingers. It can also cause shooting pains up the arm to the elbow, and in severe instances, it can cause the muscle in the base of the thumb to atrophy. CTS is diagnosed via a physical exam and by taking a medical history and description of symptoms. Our chiropractor may also have you perform certain tasks in order to reproduce the symptoms in our office. Once a complete diagnosis has been made, a treatment program will be developed for you. Our chiropractor recommends scheduling an appointment as soon as you experience any of the symptoms of carpal tunnel syndrome. Prompt treatment can alleviate your numbness, tingling and hand weakness and help prevent advanced symptoms of CTS. Chiropractic adjustments are performed by our chiropractor in order to ensure that the small bones in your wrist are properly aligned. This can help reduce inflammation and give your median nerve more room, which will improve your symptoms and increase the function of your wrist and hand. It may take several sessions before your symptoms have dramatically improved. Our chiropractic can help you alleviate your symptoms during the say by recommending certain lifestyle and ergonomic changes, like stopping or reducing your participation in activities that cause an increase in your pain and numbness. If you type or work at a computer for a living, it is imperative that you keep your wrists in a neutral position. This can be accomplished by adjusting your keyboard so that your wrists do not bend up or down as you work. Our chiropractor may recommend resting and icing your wrist for 10 or 15 minutes at a time when your symptoms become severe. Wearing a special brace, especially at night, can help reduce inflammation and pain. To schedule an appointment with our chiropractor in Tracy, CA, call our chiropractic office in Tracy, CA today!